Hannover/Kaluga, Russia, 12th April, 2018. The leading technology company Continental, celebrated on April 11th the production of its 10,000,000 tire at its tire plant in Kaluga, Russia, only five years after the start of production. The Kaluga team welcomed on this special occasion government officials, representatives of the executive board of Continental, media and customers as well as employees for a celebration event at the facility. The plant in Kaluga is equipped with state of the art tire manufacturing technology and delivers a wide range of passenger and light truck tire products both to original equipment and replacement customers in Russia, EMEA and APAC countries. The plant is renown in the global Continental manufacturing network for outstanding quality standards and therefore won the internal Quality Award 2017. In total the team grew to around 1,000 employees since start of production. “The Greenfield Tire Plant Kaluga is now a mature plant and a success story for us. It is an important part of our Vision 2025 - the strategy of the Tire Division, which focuses on growth, value creation and excellence. With excelling at exactly these three values the team in Kaluga has progressed consistently and achieved all goals successfully. In 2011 we have laid the foundation of this tire plant, in 2013 we have started production, in 2014 we had celebrated the 1st million tire and today we have reached already the ten millionth tire. It is a pleasure for me to see that in less than 5 years of the plant’s activity we have achieved such excellent results. This is a clear growth path and my thank you goes to all who have contributed to make this celebration today possible. 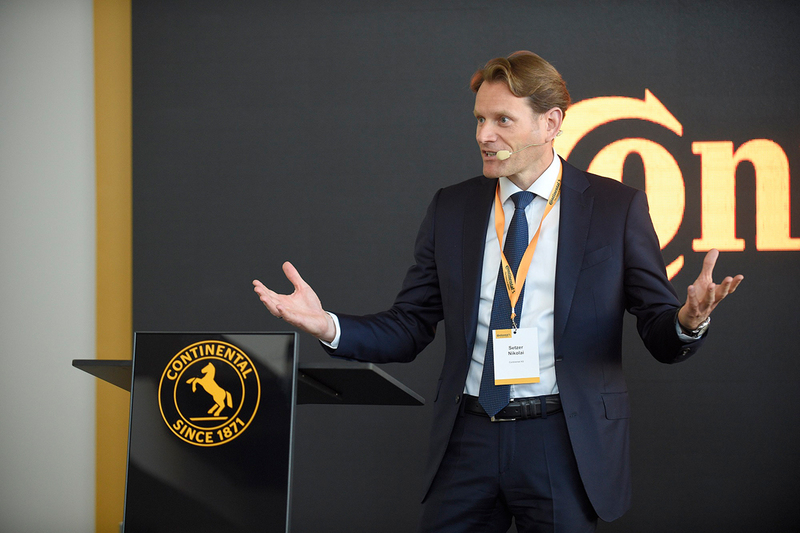 Together, we have managed to maintain the growth pace of this plant in a complex and dynamic environment and we have kept our promise to our customers, by constantly delivering excellent products” declared Nikolai Setzer, member of the Executive Board of Continental and Head of the Tire Division. The tires produced with German engineering technology at the Continental plant in Kaluga are delivered both to the Russian market and abroad to various EMEA and APAC countries. The company is also expanding its partnership with car manufacturers - large Russian and foreign companies work with the Kaluga tire plant products. Such interest to the goods manufactured at the Russian plant is due to high quality proved by international certificates. All the items produced at the plant meet quality standards ISO/TS 16949. “Tires are the only mediators between the road and the car, therefore we are responsible for the road safety. We ensure highest standards and a strong internal control at the every production stage to provide products of the highest quality to our customers. The Kaluga plant is an excellent example of synergy of state of the art equipment, innovative technologies, well-coordinated and efficient team that allowed the plant to become a leader in terms of quality among all the Continental tire productions in a very short period”, highlighted Setzer in his speech. The quality of the tires produced in Kaluga is proved by the evaluation of independent experts and customers. Continental tire plant in Kaluga confirmed its compliance with the German Processes Quality Standart VDA 6.3 and received the highest rating grade “A” from Volkswagen at the audit results. Such rating level proves that all the products features at all stages and all systems involved in manufacturing meet international demands. High quality results are due to professionalism of the company’s employees. At present, there are more than 1000 specialists working at the Kaluga Continental plant, some of those have achieved great career peaks and are now sharing their experience with freshly hired staff members at the Greenfields in Thailand and North America. “We are selecting our people with the aim of ‘best fit’ for each position and provide our personnel with opportunity for career development, professional and personal growth, - says Georgy Rotov, OOO “Continental Kaluga” General Director. – Our employees undergo onsite trainings as well as abroad. Consequently they grew into highly-skilled experts and regularly attend other Continental plants around the world within the international projects or simply to share experience”, added Rotov. Apart from the quality of the goods, the company pays a lot of attention to maintaining ecologically friendly processes. Approximately 95% of the production wastes are suitable for processing and go through recycling. In 2016 year Continental Russia started its activity in developing the system of collecting and utilizing exhausted car tires in Russia and in 2017 became co-founder of “EcoTireUnion”. The company’s efforts in the sphere of environmental protection were highly estimated during recertification audit where it received approval according to the new standard system of ecological management ISO 14001:2015. The company’s product range is constantly expanding adjusting to the needs of perpetually changing market. Such approach allows the enterprise to keep its positions even in a complex and dynamic environment. The production portfolio of the plant includes more than 300 tire articles, passenger and light truck tires from 13 to 21 inches. In March 2018, 21-inch tire serial production was launched. Now, the plant is producing tires under the name of three brands: Continental, Gislaved and Matador.